If you talk to someone who is busy starting up a venture the first printing they normally require are business cards. What do you need to know to create a good business card? In South Africa the standard business card size is 90x50mm. Don’t be tempted to print yours in a different size keep in mind that all your customers will use some kind of business card holder and just think where your card will end up if it does not fit in there. Yes file 13! A good card will have the business name on and than your name and very important your contact detail. Remember if you try to fit too much on a card you will end up with text way too small to read. It sort of defies the object. Customers often ask about which paper to use for their business cards. The standard is 250g/m3. If you want something thicker keep in mind that it will push up the price and most papers are only available in 250g/m3. 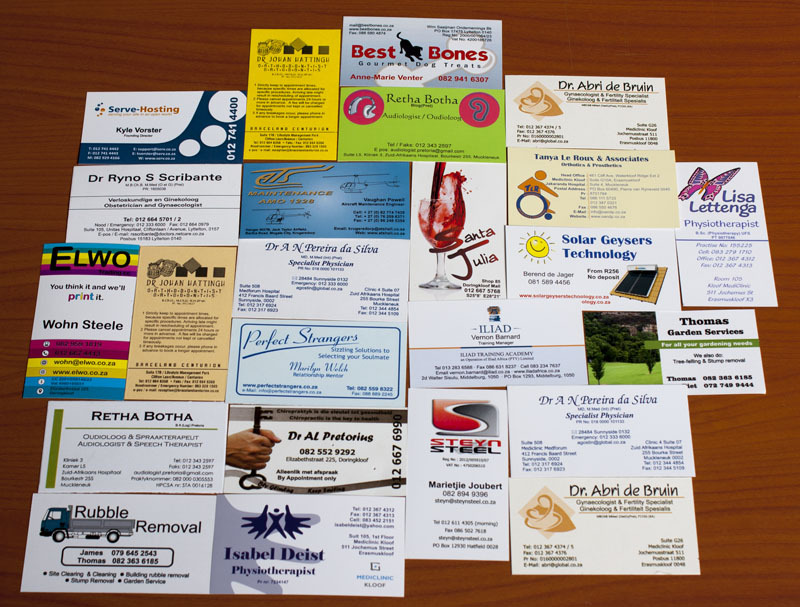 We will gladly print you any quantity of cards from 100 upwards. Higher quantities will normally work out at a better price per unit.